An official teaser website launched and announced a TV anime adaptation for web manga Somali to Mori no Kamisama. The anime is slated for this fall. The world is ruled by spirits, goblins, and all manner of strange creatures. Human beings are persecuted, to the very point of extinction. One day, a golem and a lone human girl meet. This is a record of the pair, one a member of a ruined race, the other a watchman of the forest. It tells of their travels together, and of the bond between father and daughter. Somali to Mori no Kamisama has been serialized via Web Comic Zenyon by Yako Gureishi since April 2015. Tokuma Shoten released the manga in physical volumes in the North Stars Pictures imprint since November 2015, and the series' sixth volume will be released on April 20. SATELIGHT!!!! So after two years, they finally have an anime airing in the Fall season. I guess it's to make up for them not making anything for Spring because of the delay of XV. And the director, Kenji Yasuda of Hakata Tonkotsu Ramens is working on it too! And Yasuda was the director of Croisee in a Foreign Labyrinth, so this should be right up his alley! 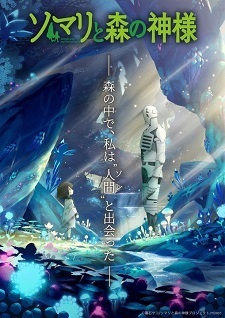 Based on the key visual, all they need now is a good art director and this should be a pretty nice watch. It's Satelight, so it's a definite watch for me. Just found out about this news today. Didn't see this news last Saturday because it must have been buried by the influx of other big anime news. This looks like my type of anime, but with the main heroine being voiced by my favorite seiyuu just made this show a must-watch for me, that's for sure! Love the manga (if my profile picture was any indication) so I'm looking forward to this one...even though the studio is making me a bit nervous about how it will turn out. Love fantasy, love slice, love the synopsis and the VAs, but shame it's Satelight making it. Very cautiously optimistic. This sounds pretty cute and interesting, will certainly be watching it when it comes out. I absolutely adore this manga so I'm super excited for this! Cool news. I have read the manga and its very interesting for its fantasy worldbuilding. But given that studio Satelight doing this quite worries me if they can do justice with the manga's artstyle. Their recent anime were not good looking tbh..
Will keep an eye on this for now. Simple and interesting synopsis! Seems kinda slice of life-ish in a fantasy/dystopian setting, cool mix! I'm in! Crunchyroll announced the stream for this today. Apparently, they're also co-producing it. Anyways, I read the manga for this and it's a pretty interesting series.